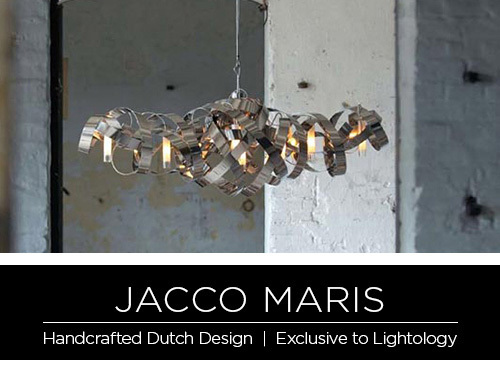 Danish lighting firm Jacco Maris uses their trademark curved steel strips in much of their distinctive lighting. This touch of grace and beauty in their contemporary industrial designs strikes a unique profile in any interior. Since the launch of Jacco Maris Designs in 1994, the studio has developed a number of distinctive lighting collections, each with its own character and form. Many of the designs feature Maris’ trademark material of bent steel strip, either alone or in concert with some of the brand’s other distinguishing elements—stainless steel, black steel, and brass. These modern lighting creations play with themes of power and grace, striking a unique profile in any contemporary interior. Each floor lamp, pendant, suspension, wall lamp, and indirect wall sconce is handmade and artfully crafted in the Jacco Maris lighting design studio in the Netherlands.